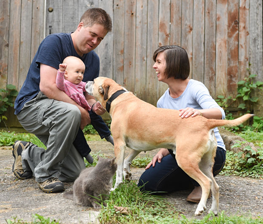 There have been some beautiful fall home tours going around the blogosphere recently. I’ve held off on bringing fall inside, trying to hang onto summer just a little bit longer. However, now that it’s October, I can’t deny that fall is here. 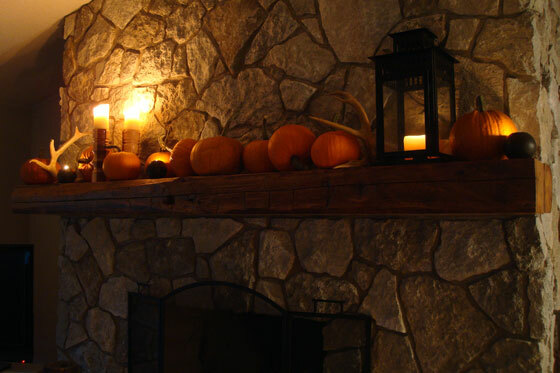 This is our first fall having a working fireplace, so that’s where I started my decor. 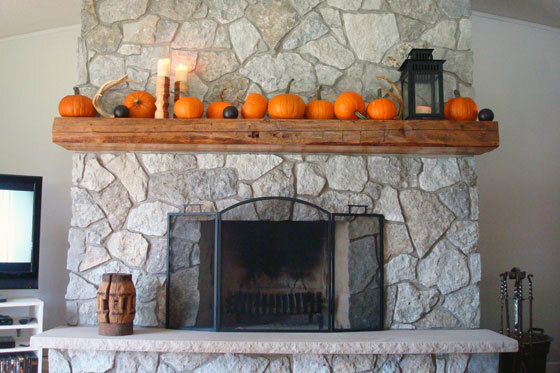 Behold the fall mantel. The black lantern, wooden sphere tealight holders and antlers have become staples on the mantel. 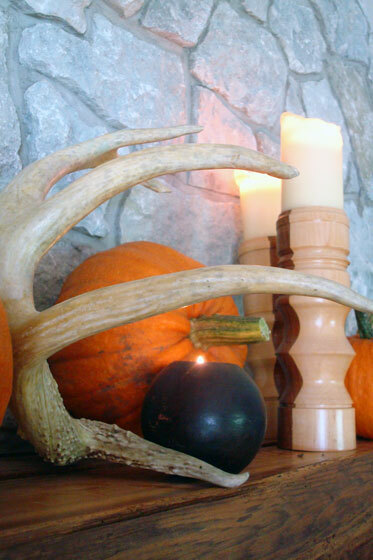 For fall, I added two wooden candlesticks that my Dad made and a whole bunch of pumpkins. 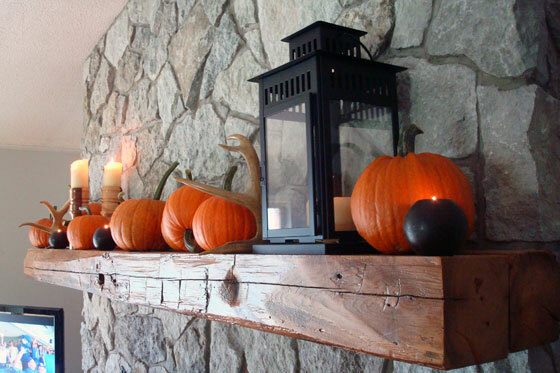 I love the barn beam mantel so much. The wood against the stone is beautiful. Now with the pops or orange and black it feels right for fall. The only thing we have yet to do to fully embrace fall is light the fire. How are you decorating for fall? Have you had a fire at your house yet? Did anyone else grow your own pumpkins? Any suggestions of what to make with the pumpkins (besides jack o’ lanterns)? How about tips to store the pumpkins? Who else is watching the baseball? Let’s hear it for the Jays! I love all the pumpkins! I’m in love with the mini pumpkins this season! I haven’t started decorating yet, but I think this weekend is a good time to start! Thanks. We had so many in the garden that it was a no-brainer to use them on the mantel… although they may soon disappear and reappear in pie form. Good luck with your decorating. I hope you’re able to find some mini-pumpkins! Are these even edible? I usually see them being fed to the pigs. I recommend hokkaido pumpkins for winter reserve. They have very hard skin that protects them until January or February and they make the most amazing crazy orange cream soup. Absolutely! They’re pie pumpkins, and they’re pretty common in our area. I’m planning on making lots of soup, some baking and probably a few pies. If cured properly they should store fine. Thanks for the suggestion of hokkaido pumpkins. I’ve never heard of them. They have a really neat shape. Do you have a favourite soup recipe? Well, its not really a recipe, more like a guideline. You slice a little bit of onion so that it turns clear, add one small potato (cut into small cubes – it makes soup more dense), pumpkin and other vegetables of your desire. Add salt and a pinch of kurkuma. Cook for about 15 min, blend everything with hand mixer and add big spoon of sour cream. It goes well with roasted bread cubes. That sounds great. Does the sour cream go on top or do you mix it in? The orange is great pop of color! I love the mix of textures and shapes! What a great mantle arrangement! Thanks. I was really pleased with how it worked out. 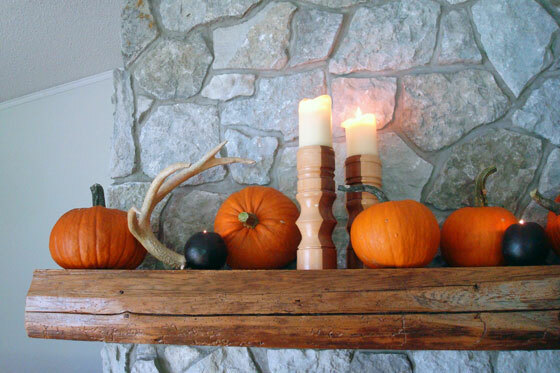 Your mantel looks awesome, especially with the lights out! Woo, cozy and a bit spooky, perfect for October. Combine turnip, applesauce, eggs, 1 c crumbs, 6 T butter, sugar, salt and pepper. Turn into greased casserole dish and top with remaining crumbs and butter. Bake at 350 for 30 minutes. Thanks so much for this. It sounds quite good. I like that it’s not loaded with cheese. I love cheese, but so many casseroles are a bit overdone for me. This sounds like you might actually taste the vegetables.